. (1390). مصاحبه اختصاصی مجله منظر با خوائو نونش. مجله علمی-ترویجی منظر, 3(15), 40-45.
. "مصاحبه اختصاصی مجله منظر با خوائو نونش". 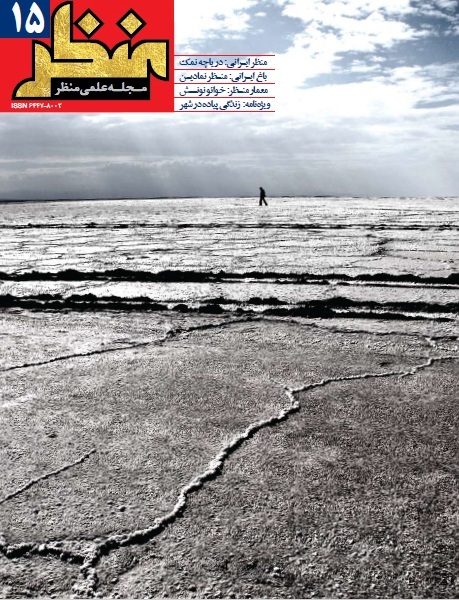 مجله علمی-ترویجی منظر, 3, 15, 1390, 40-45.
. (1390). 'مصاحبه اختصاصی مجله منظر با خوائو نونش', مجله علمی-ترویجی منظر, 3(15), pp. 40-45.
. مصاحبه اختصاصی مجله منظر با خوائو نونش. مجله علمی-ترویجی منظر, 1390; 3(15): 40-45. On the September, 2nd, 2011 Manzar magazine arranged an interview with João Nunes through internet and asked him about his theories in landscape, his concepts in his different projects on different contexts around the world. You can read about his most significant concepts and ideas have mentioned in this interview in the following: The most fundamental concepts that make myprojects special is that landscape is a coordinative work in which one of the authors should act humbly and remember that the beginning of landscape has started thousands of years ago. This means we should create a profound context in which nature and skills, chance and logic , success and failure all exist in the same productive possibility. In this case, there is no effort to look for form or function. What we are looking for is the mechanisms that changes the structure and learn how to use them while directing them in a temporary period. As a result, the selfish encounter of the author is weakened that usually leads to creating the objects which are hard to take care of, because they are out of the function. My early work in the nineties gradually showcased that time always was the focal point in landscape dialogue. Projecting landscape means succeeding in interpreting the past and suggesting for the future. A metric, a rhythm, or a way for relating different times together (a sedentary and moving object, gradual and fast growth, temporary and permanent, the scale in our life and other scales, worthy of time and not) And all we have in this case is the existing situation and its offering opportunities. Projecting landscape is projecting different times together. The dialogue power in landscape ( I am talking about an architectural dialogue of renovation and proposition, not the conservative and reactionary one, like usual)and mastery, the pure, hard, closed and formalist architecture varies conversely. It has the same relationship to the celebration of vanity, worship of image, futility and superficiality in architectural mechanism. In our opinion, landscape means alteration and variation and working in this field means understanding the dynamics in theses alterations and directing them especially in a conservative way. This doesn’t mean freezing the images but to amplify the force in preserving them. I always believe that writing history is magnificent. The history of the mechanisms that change the world is written through humble and insignificant processes and I believe that landscape is a part in the mechanisms that makes the future. The humble mechanisms which are almost imperceptible lead to the most important and effective results in landscape. Even the most powerful Landscape processes don’t need evident proofs. A mellow but frequent movement repeated for a long period of time can create a beginning for magnificent and appreciative processes.